Are you a web developer who is looking forward to making a clean and elegant looking website? Rabbit is your best choice here. A gentle looking straight forward and a neat and tidy, Bootstrap Personal Portfolio Template for your creative personal portfolio website. Why Rabbit – Free Bootstrap Personal Portfolio Template? 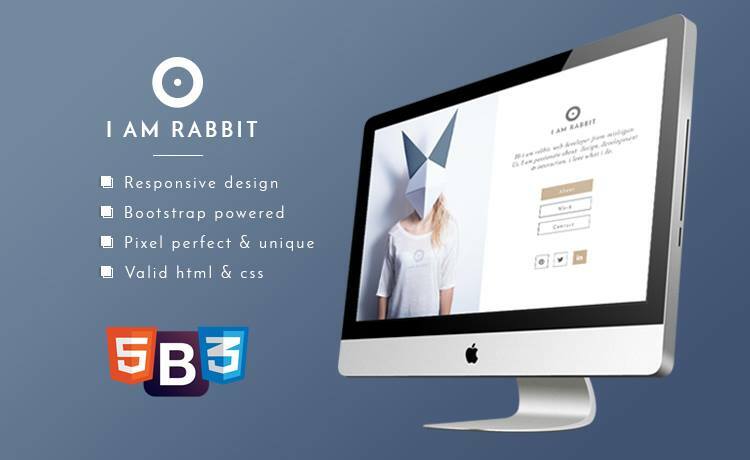 Rabbit is a very soft and fresh looking excellent quality free bootstrap theme. The most significant features are it is a lightweight, clean and very sharp looking template. If you want to keep your website very simple and smart, then this Free Bootstrap Template for Creative Personal Portfolio Website is the best choice for you. The most noteworthy feature of Rabbit is the template is beautiful and simple. Rabbit comes with four different information pages for your mandatory information. The startup words lie here. Yoy may write an overall impression on you for your clients. They may have a glimpse look. Contact page contains the information needed to make the communication. The most frustrating moment is when the very expensive template you’ve bought doesn’t have a smooth response on smartphones. This Free Bootstrap Template for Creative Personal Portfolio Website comes with cent percent mobile or smartphone response. Rabbit is one unique web template design. Mainly for the clients who wants to keep is very simple and extremely gentle. Thanks in advance for using Rabbit.